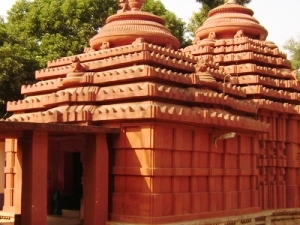 Lankeswari temple is located inside the river Mahanadi at Sonepur town, Subarnapur district, Odisha, India. Once upon a time Sonepur region was known as Paschima Lanka. Goddess Lankeswari was the presiding deity of Paschima Lanka. Now Maa Lankeswari is worshiped by the Kaivarta (fisherman) community of Sonepur and people of Subarnapur district.One can see this temple while traveling on the road connecting Ulunda, Dharmasala, Sonepur and Birmaharajpur. It is believed that the King of Lanka, mighty Ravana brought the goddess Lankeswari from Lanka to Sonepur as he had an army base in Sonepur. Sonepur is often described as Paschima Lanka or Swarnapuri Lanka or dwitiya Lanka or Subarnapur. This is further evidence that Sonepur is a strong hold of Tantric and Shakti culture.As this area belonged to Dakshina Kosala Kingdom,evidences are there in Ramayana that Ravana used to attack this part frequently.